The St. Regis Singapore, the new measure of modern refinement and luxury, is superbly located in the heart of the uptown Orchard Road shopping and embassy district. Just steps away is the Singapore Botanic Gardens and world-class medical hub. Bask in the tropical summer at the heart of the shopping and embassy district at The St. Regis Singapore. A pinnacle of luxury hospitality, be pampered by the legendary St. Regis Butler Service at one of the best Singapore hotels Orchard Road has to offer. Reside at the perfect address, providing respite from the lively Orchard Road dining and shopping scene. Enter a world of rejuvenation at the award-winning Remède Spa, indulging in acclaimed signature treatments like the Warm Jade Stone Massage. They perfect the art of elegance in the 299 luxuriously appointed rooms and suites. Each detail- crystal chandelier, original art piece or lush designer fabric is meticulously selected. St. Regis Butler Service is available any time, day or night. The fine art of hospitality, refined over a century of the storied legacy, awaits throughout the 299 elegantly appointed guestrooms and suites at The St. Regis Singapore. 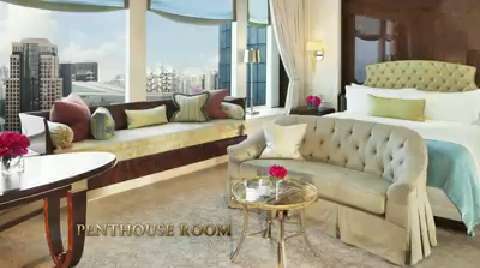 With stunning vistas of Singapore's downtown skyline, the view inside your luxurious residence is just as spectacular with full silk-shaded chandeliers, bespoke furniture, lush fabrics, French marble bathroom and state-of-the-art electronics and telecommunications, including Singapore's very first IP phones. Make yourself comfortably at home by enjoying the specially designed feather pillows, luxurious linen, spacious bathrooms, oversized freestanding bathtub, motorized blackout roller blinds and of course, the signature St. Regis Butlers who provide a myriad of bespoke services. Inspired by heritage and tradition, borne of luxury and refinement, The St. Regis Singapore provides an exclusive entrée to a refuge of timeless elegance and discerning taste, dedicated to the art of culinary excellence and celebrated epicurean experiences. Savour epicurean experiences of authentic French cuisine, traditional Cantonese Dim Sum and delicacies, and Italian pizza and pastas, presenting a captivating array of global dining journeys. Escape to the decadent urban sanctuary for a bespoke pampering experience of a lifetime. Indulge in the lovely floral tea ritual with custom-blended teas, chilled Champagne and artisan chocolate bon bons while enjoying bespoke details such as the aqua reflex path, eucalyptus-scented steam chambers of varying temperatures, personal iPods and a mind-centering spa garden. Every face and body is unique and the staff of expert aestheticians and therapists is passionately committed to creating a customized treatment experience to fulfill your individual needs. They use only Laboratorie Remède products, the acclaimed French and Swiss-formulated line known for premium high-performance ingredients and superior efficacy. Choose from the extensive menu inspired by holistic traditions from ancient Rome to ancient China or opt for the St. Regis Signature treatments available only at Remède Spa Singapore, such as the balancing, tension-easing Warm Jade Stone Massage or the purifying and invigorating Olive & Eucalyptus Black Soap Body Wash & Scrub. The unique heritage of providing butler service to every St. Regis guest is an unparalleled symbol of uncompromising, consistent luxury. With over 100 years of experiences in providing handcrafted service, no request is too unattainable or small to fulfill for a St. Regis Butler. Allow the St. Regis Butlers to tailor an experience of flawless personalized attention, with provision of signature butler services. Whether it be packing and unpacking of your luggage, remembering your preference of coffee or tea, or polishing your shoes, your St. Regis butler remains at your service, regardless the hour. The address that defines stature and social distinction, The St. Regis Singapore curates extraordinary moments for high society parties and business gatherings of individuals of influence. The St. Regis Event Butlers are committed to crafting occasions that meet your highest standards and exceed your expectations. The majestic John Jacob Ballroom, with its high ceilings and skylights, transforms into a spectacular venue for gala dinners, grand weddings, prestigious birthday celebrations and corporate events.